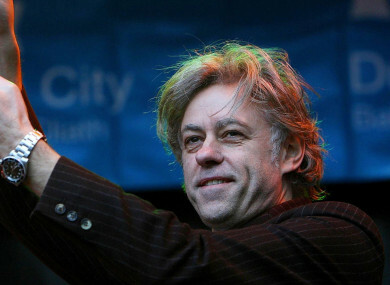 Geldof accepting the freedom of Dublin city in 2006. BOB GELDOF IS to return his freedom of Dublin city in protest at the award also being held by Myanmar’s leader Aung San Suu Kyi. Geldof has said he is “a very proud Dubliner” but that Suu Kyi is engaged with “ mass ethnic cleansing” and he in no way wants to be associated with her. Aung San Suu Kyi was awarded the Freedom of the City on 1 November 1999, the same day all the members of U2 also received the award. Suu Kyi was under house arrest in Myanmar when she was honoured and she accepted it in person in 2012. Geldof received the freedom of Dublin city in November 2005 but he has now said he will hand it back to the city manager at City Hall today at 11 am today. Dublin City Council confirmed that Geldof would be “handing back the scroll he received” and that an official from the council would be there to accept it from him. “It is with deep sadness and great regret that I feel obliged to return to Dublin City Council the great honour bestowed upon me of the Freedom of the City of Dublin, Geldof said in a statement. I am a very proud Dubliner but cannot in all conscience continue to be one of the honoured few to have received this great tribute whilst Aung San Suu Kyi remains amongst that number. In short, I do not wish to be associated in any way with an individual currently engaged in the mass ethnic cleansing of the Rohingya people of north-west Burma. Up to half a million Rohingya muslims have been fleeing Myanmar towards Bangladesh amid a military crackdown that has been has been described as ethnic cleansing. The Rohingya people have had a long and troubled history in Myanmar, where many of the country’s 60 million people look at them with disdain. Though members of the long-persecuted religious minority first arrived generations ago, they were stripped of their citizenship in 1982, denying them almost all rights and rendering them stateless. Suu Kyi is the de facto leader of Myanmar although her actual power has been questioned with the country effectively run by the its military. Despite this, Suu Kyi has not spoken out against the violence against the Rohingya, instead saying that the “great majority” of muslims within the conflict zone had not filed. “I am a founding patron of The Aegis Trust who are concerned with genocide prevention and studies. Its founders built and maintain the National Holocaust Museum of the UK,” Geldof said. I spoke at the inaugural National Holocaust Memorial Day at Westminster and in my time, I have walked amongst peoples who were sectionally targeted with ethnic cleansing. I would be a hypocrite now were I to share honours with one who has become at best an accomplice to murder, complicit in ethnic cleansing and a handmaiden to genocide. “Her association with our city shames us all and we should have no truck with it, even by default. We honoured her, now she appalls and shames us,” he added. Dublin-born Geldof was awarded a KBE (Knight Commander of the Order of the British Empire) by Britain’s Queen Elizabeth II in 1986 due to his fundraising with the Live Aid project. In a response to Geldof’s decision, Dublin’s mayor Mícheál Mac Donncha said that he was entitled to return his award but that he himself has spoken out against the killing of Rohingya muslims. “As Ardmhéara I have condemned the persecution of the Rohingya people and their expulsion from their homes by the military in Myanmar and the failure of Aung San Suu Kyi to even acknowledge, let alone condemn, what the UN has described as ethnic cleansing,” Mac Donncha. The mayor went on to say that he felt Geldof’s decision is “ironic” given his KBE from Britain’s Queen. Regarding Mr Geldof himself, I find it ironic that he makes this gesture while proudly retaining his title as Knight Commander of the Order of the British Empire, given the shameful record of British imperialism across the globe. Mr Geldof last year grossly insulted the men and women of the 1916 Rising in the centenary year when he compared them to so-called Islamic State, causing offence to Dubliners and Irish people generally. Speaking on RTÉ’s Sean O’Rourke programme in response to Mac Donncha, Geldof said the Sinn Féin politician was deflecting. “Sinn Féin is of course trying to distract attention from some non sequitur,” Geldof said. The former Boomtown Rats singer has said that he would be proud to have the Freedom of the City of Dublin restored on him should it be stripped from Suu Kyi. In the UK, the Freedom of Oxford was stripped from Suu Kyi last month. Email “Bob Geldof defends decision to return the Freedom of the City of Dublin”. Feedback on “Bob Geldof defends decision to return the Freedom of the City of Dublin”.